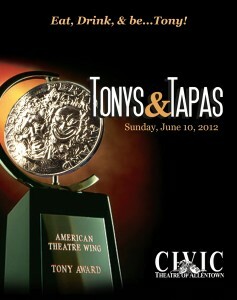 As a "Tonys and Tapas" guest you will sample tasty morsels from some of the area's top restaurants and caterers (including Catering by Karen Hunter, Maison Blanc, The Cosmopolitan, Bamboo, Carraba's, and more) while you enjoy a spirited musical review of Tony-winning/nominated musicals by performers from Civic Theatre. There will be an exciting silent auction (featuring great theatre memorabilia as well as merchandise from area merchants). Their wine bar will be open and their signature Mar-Tonis will be flowing. All proceeds benefit Civic Theatre's operating fund. Tickets are $75 per person or $130 per couple. Patron seating is $250 (for two tickets and a host of benefits). Doors will open at 3:30 pm with a performance at 4 pm. Sponsorships are available. Please call Nancy Keeler at 610-433-8903 x 201. Call the Civic Theatre Box Office at 610-432-8943 for tickets and information.